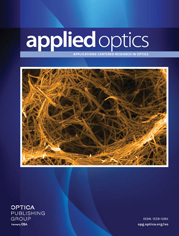 J. Liñares and M. C. Nistal are with Area de Optica, Departamento de Fisica Aplicada, Facultade de Fisica e Escola Universitaria de Optica e Optometria, Universidade de Santiago de Compostela, E-15706 Santiago de Compostela, Galicia, Spain. K. S. R. Krishna is with the Optical Design Group, Instruments Research and Development Establishment, Dehradun-248 008, India. We numerically solve a diffusion-type equation for the accumulated interdiffusion coefficient in an interacting system (nonideal ion-exchange reaction) by using a modified Crank–Nicolson algorithm. We obtain exact and approximate index profiles in such a way that bump effects found in experimental ionic concentrations in glass are explained as a result of cation–cation interactions.